Samac is a Q’ekchi’ name. Sa’ is like the preposition in or inside. Some say Mac is short for Macodio, some ancient resident of distinction. But the idea that Samac’s name means In (the place of) Macodio strikes me as apocryphal. Mot k’ek means dream. So Sa’ mot k’ek means Inside a dream. This is one offered explanation. But Sa also means tasty. So maybe Samac refers to a delicious dream. Then again, Sa’ also means stomach, so maybe Samac is some sort of dream stomach. Maak means sin, so Sa’ maak means In sin (or stomach sin, delicious sin, etc.). Unlikely. The most reasonable theory is that Samac is a corruption of Zamat, a serrated, leafy plant that grows here. Zamat has a flavor similar to cilantro and is used in stew, which is the most common meal in the village. The town has no library and very little in the way of historical documents, but from what I’ve gathered, the area now known as Samac used to be the plantation and property of Gustavo Helmerich, a German planter. Helmerich was captivated by Samac’s landscape and people. He lived his entire life in Samac, somehow avoiding expulsion, and died here fifty years ago, in May of 1958. His wife, Anna Roth followed in September of 1963. The two of them are buried in a cemetery on a hill to the east of the cooperative. The plantation property went to the state (perhaps explaining how the couple dodged expulsion). The people say that the Helmerichs died poor and their estate only consisted of property. I suspect there’s more to the story. Their productive land holdings were considerable, spanning a handful of the area’s current cooperatives. The on-site equipment was extensive (including a water-driven electric generator), and local labor costs were undoubtedly low. But the fact that they’re buried here is evidence that they couldn’t afford to return home to Germany in their old age. The people of Samac formed a cooperative and successfully solicited the rights to the land and infrastructure in 1971. The whole region fell on hard times during the 36-year armed conflict, especially during the early eighties. La casa patronal, the main management building, had to be completely rebuilt. Construction was completed in 1998. The people grow maiz, sugarcane, and beans. 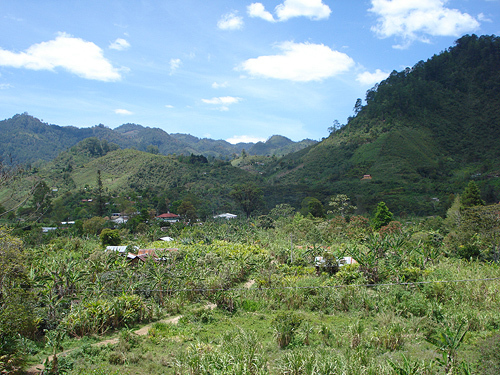 But the cooperative has been economically reliant on coffee and cardamom since it’s inception. 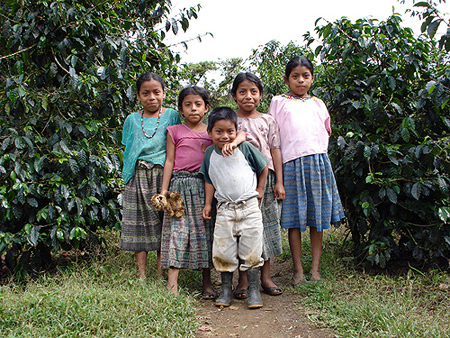 Around 2001, the international price of coffee dropped, upsetting the financial stability of the whole village. The cooperative decided to diversify its production. In addition to growing tomatoes, peas, and tilapia, the cooperative has plans to develop an ecotourism program to take advantage of Guatemala’s relatively recent emergence as a destination for international visitors. To this end, Samac has sought help in the form of a Peace Corps volunteer. Don Pedro makes his appearance on this cue. They wouldn’t let me carry my luggage. Instead, they wore my heavy suitcases up around their necks and shoulders. I arrived as an old-fashioned British explorer led by native porters. It wasn’t long before I realized their intention to treat me like a savior prince. They called a meeting of the directivas. After a brief introduction, everyone in turn made a welcome speech. Next, they invited me to speak. Knowing no one in the assembly and having nothing prepared, I looked around quickly for an out. Seeing none, I launched into a speech about the two years ahead of us and thanked everyone, emphasizing how impresionante the town was. They clapped when I finished. But in my head, the applause was because I made words come out. Next, they took me to the school. They interrupted lessons and gathered all the students in the yard. Again, I was asked to speak, and again I said (something). For some reason, they thought it was an opportunity to read my resumé. A member of the directiva read my resumé from blue iguanas to this boy’s trouble to the crowd of schoolchildren. As soon as he finished, the whole school clapped and cheered. I don’t know if you’ve ever had a crowd go wild at a recitation of your resumé. But you should try it. It’s great. Afterwards, I started to hear “Pedro!” wherever I went. Whenever the kids see me, they are compelled to call me. Sometimes they yell across a valley at me and I have to wave blindly at the bank of trees where I assume they must be. This is unconditional popularity. But it’s clear that I’m a strange fish and they can’t resist tapping the glass to see what I do. Don Giraldo hosted dinner. We had chicken stew (with zamat) in his dining hall. Almost every family has a long dining building made of wood with a dirt floor. A Catholic shrine occupies one end of the room in every case. Because of this, the room is considered sacred, and beds are not usually found in these dining rooms. After dinner, it started to cool down. I asked Don Francisco if it got any colder. The answer was no, but the truth, as I would discover hours later, was different. I suspect that cold air drifts down from higher elevations during the night. The change is dramatic. It drops into the sixties. This doesn’t sound very cold until you consider that the distinction between indoors and out is purely symbolic. At one AM, I realized I wasn’t going to sleep very well. The next night I went to my little cot dressed for winter. So on day three I took a bus to Cobán, spent a thousand quetzales on a new bed plus sheets and a comforter, and took it all home on the top of a bus (exactly as relaxing as it sounds). And I finally slept through the night. My second-smartest purchase was a soccer ball from the supermarket. Pretty soon I had the kids knocking down the door to play. “Lu’! Prestame su pelota.” (Loan me your ball (rude!)). So I include myself in all the best soccer games. 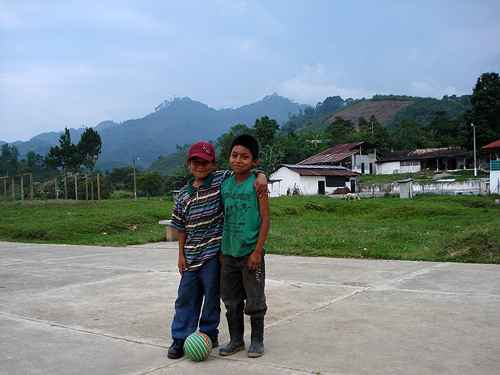 We play on a small concrete court in the center of town, a playing surface that makes me peculiarly aware of my teeth. The ball goes everywhere. By the time it’s dark, we have sloppy brown circles on our knees and chests and sheep feces in our hair. Samac and I haven’t reached an understanding quite yet. If I open my window to let in some light, people poke their heads into my room. This is unwelcome. If I’m caught reading a book or looking out the bus window, I have to hear questions about my sadness. How do I explain the value of occasional solitude? Don Francisco told me to get a radio for company. “You can listen to music as long as you don’t cry.” Then he laughed so hard that I wondered if he was funny.